BuzzCanada: Preventing 'The Next Michael Brown Crisis'? 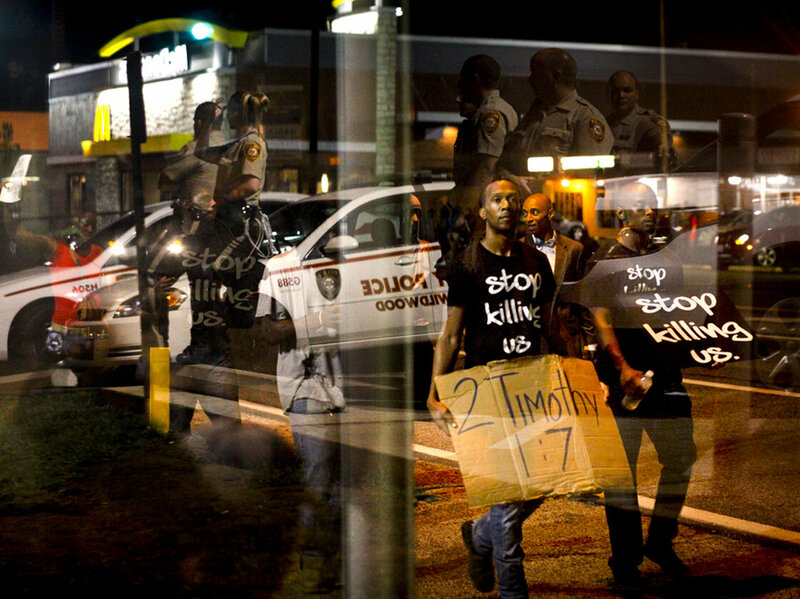 Preventing 'The Next Michael Brown Crisis'? Demonstrators last month chanted on West Florissant, one of the main boulevards in Ferguson, Mo. According to a state report, nearly 9 in 10 people stopped by the police in 2013 were black. Since the recent unrest in Ferguson, Mo., there have been a host of changes to the way the local police do business that are meant to prevent another incident like the shooting death of Michael Brown. Gov. Jay Nixon has appointed Dan Isom, an African-American, as the state's new public safety director. The city's police have begun wearing front-facing body cameras. But what exactly does it mean to "prevent the next Michael Brown"? Brown's name has become the latest in a long litany of names that in their totality represent an archetype: a black life snuffed out in an encounter with The System. He's come to represent not only himself or his community, but a much broader universe of people. You can hear echoes of the remarks President Obama made after the Trayvon Martin shooting in 2012. "If I had a son, he'd look like Trayvon," he said. It's a statement that goes beyond simple solidarity. It's more like identification: It could have been me. A few miles away in St. Louis, demonstrators were doing the same with the police officer who shot Michael Brown. I Am Darren Wilson, their signs read. Wilson's supporters from around the country have donated hundreds of thousands of dollars to help him cover the legal costs for a case that, as of right now, doesn't exist, and may never. He, too, has become an archetype: a cop doing his job in tough circumstances, battered by the media and political opportunists. "You have the killing, the protest, mainstream media catching on, the hashtags, attempts to explain the killing of unarmed people with how they looked, or what they smoked or drank or did or may have done at some other time. Then Sharpton shows up. Some high official speaks. And then someone invokes a national conversation." From the view of the protesters in each of these cases, this national conversation is about a larger, troubling idea: the cheapening of black life. Each of these stories summons a long, dark history in which black folks were killed for any number of minor or entirely imagined infractions, with sanction from civil authorities. Sometimes that sanction was official. Sometimes sheriffs and the police turned that discretion over to civilians and looked away as those civilians availed themselves of it. Either way, black people had little recourse against it, and could expect little transparency about it. In recent years, the litany of names that fit into this narrative seems to have snowballed. There was a lady on West Florissant who said she had traveled from New Jersey to join the protests in Ferguson. She held up a sign that read "JUSTICE FOR RAMARLEY GRAHAM." Like Brown, Graham was an unarmed black 18-year-old shot and killed by the police — in that 2012 case, it was in the bathroom of his home in the Bronx, halfway across the country. There are some particularly well-known names in this litany: Sean Bell. Renisha McBride. Trayvon Martin. Oscar Grant. Jordan Davis. And, most recently, Eric Garner. There are some lesser-known names: Jonathan Ferrell. John Crawford. Timothy Stansbury. And there are the names seemingly lost to history. Edward Garner, whose death was at the center of the aforementioned Supreme Court case. And Donnell Dortch. During the height of unrest in Ferguson in August, my Code Switch teammate Kat Chow uncovered his story from St. Louis County from five decades ago — in a small town called Kinloch that borders Ferguson — which shared some eerie resonances with the Michael Brown case. "Hours after his run-in with the police, Dortch died in a county hospital in Clayton, Mo., bleeding profusely from where a bullet, or bullets — it wasn't made clear how many — pierced his stomach. He was unmarried, survived by his father, Lonnie Dortch, and his mother, Mable Marable Dortch. "Kinloch exploded with anxiety and protest." The differences among all these stories are instructive. For example, Israel Mason, the officer who shot Donell Dortch in 1962, was black. But one of the similarities that jumps out about all these stories is the smallness of the incident that became the proximate cause for each death. Walking down the street. Knocking on a stranger's door for help. Playing loud music. Every time folks recite the litany, it reiterates the same idea: Black life is cheap. Every time a new person's name is added to that macabre list, that name becomes another way of invoking this idea. The roll call only grows larger, as do the stakes: Michael Brown becomes the avatar for all black men, like Trayvon Martin before him and Oscar Grant before him and Amadou Diallo before him. And consequently, their actions and the outcomes of their lives come to represent that same thing for all black men. Who are we? Mike Brown! Things that could have helped prevent the specific circumstances of Michael Brown's death — front-facing cameras, a more diverse police force, less distrust between the local police and Ferguson's black residents — come to seem like solutions to much larger questions. If Darren Wilson is put on trial, then, it's not just him on trial, but all the forces that might undergird similar calamities. It becomes easier to imagine that the outcome to such a trial — an acquittal or maybe a conviction — might somehow grant closure to the intractable social issues that form its backdrop. Brooke Gladstone plugged the details of the Michael Brown case into the familiar media template. "The mainstream media arrives as swiftly as the protests and hashtags and Al Sharpton. We quickly learn Garner was selling loose cigarettes. Hey, that's not legal! And then, the widely read website Vox notes, it sparks a national conversation about the use of force by police officers." "Perhaps, rather than investigating the actions of any one officer, it's time to rethink what lengths we as a society will go to in the name of law and order." To this point, giving officers front-facing cameras doesn't address the larger question of the ways police intersect with black communities. But this litany of names isn't simply about individual policing and the use of force; when someone summons Trayvon Martin or Renisha McBride, they're invoking killings in which police were not involved. There were separate if not unrelated issues at play in those stories. Those conversations were also about stand-your-ground laws, gun rights and how we determine who we think of as a threat. If history is any guide, then our attention will continue to focus on how the particular events in Ferguson play out. Some journalists will remain there to follow what happens next. There will be anniversary coverage next summer about what, if anything, has changed there since the nation trained its eyes on the small Midwestern town. We'll look to these events for answers to all these larger questions about the value of black lives. But instead we'll just find more questions. And then, before too long, another name will be added to the litany. The resolution of this particular story — the future of Darren Wilson, the way Ferguson might change how its police officers are trained or what they must wear — seems concrete, definitive. Stories like Michael Brown's, with its particular characters, conflict and setting, are easier to keep in focus than the larger open-ended questions that they raise: the things we use policing for, how we grapple with the long-tailed legacies of segregation, the matters of rights and policies that set the value of lives. But the paradox is that on some level, when we substitute Michael Brown, the young man who wrote rhymes and struggled in school but graduated after a push from his family and teachers, for "Michael Brown," the most recent avatar for this cluster of intractable social issues, we focus on individual outcomes at the expense of focusing on systems and laws. "Preventing the next Michael Brown," then, means giving complicated conversations about policing strategy and residential segregation the same airtime that we might give to the quelling of protests or the fate of Darren Wilson and the Ferguson police. It means not merely reciting the litany of names, but grappling with the history that litany represents.